Legendarily insane Japanese game designer Hideo Kojima is finally on Twitter, and is using the service to promote the hell out of the upcoming Metal Gear Solid: Peace Walker, which he's calling "a test." Ah, Twitter. Once a mere curiosity, these days it's more surprising to see a celebrity or company - particularly those in the realm of traditional "nerddom" - who lacks a Twitter account than the other way around. Some people have been slightly slower on the uptake than others, and others may just have been too busy to hop on board the Twitter Train (Twain? 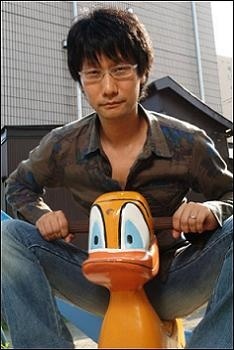 ), which may be why it's taken so long for Metal Gear Solid creator Hideo Kojima to get his own Twitter account. Kojima's Twitter is, of course, completely in Japanese (which would, y'know, make sense), but thanks to Andriasang we know that the game designer is currently hard at work talking up Metal Gear Solid: Peace Walker. According to Kojima, the existence of Peace Walker - which was once MGS5 - doesn't mean that the PSP will be the de facto platform for the series going forward. "PW is a test," wrote Kojima, "to see what type of expansions are there if MGS is brought to a portable. We're not just rising vertically with development on next generation systems, but also horizontally, trying to expand gameplay." But where is this expanded gameplay? If you're thinking to yourself that screens and video of Peace Walker look just like every other Metal Gear Solid, then Kojima thinks you'll change your mind once you get your hands on it - like audiences changed their tune once they'd actually seen James Cameron's blockbuster Avatar in glorious 3D. "It's difficult to show the interest and freshness of PW through video. Cameron's Avatar was a huge hit because of the 3D video. That can't be communicated through text and a trailer. It's something you won't understand unless you experience it for yourself in the theater." I'm not sure how playing a game on a tiny screen is comparable to seeing a special-effects bonanza in full 3D, but that's Kojima for you. Peace Walker is out at the end of May in the US and Europe.